Objective: Storage time without use (STWU) in the supporting electrolyte solution for time periods beyond 30 hours deactivates poly(o-aminophenol) (POAP) films. Observations: Deactivated POAP films exhibit a lower conductivity than freshly prepared (nondeactivated) films Considering the interest in POAP synthesized in acid medium in both basic and applied research, not much attention has been paid to the decay of the electroactivity of POAP caused by its extensive use. Conclusion: Deactivation of poly(o-aminophenol) (POAP) film electrodes by STWU in the supporting electrolyte solution is reviewed in this work. 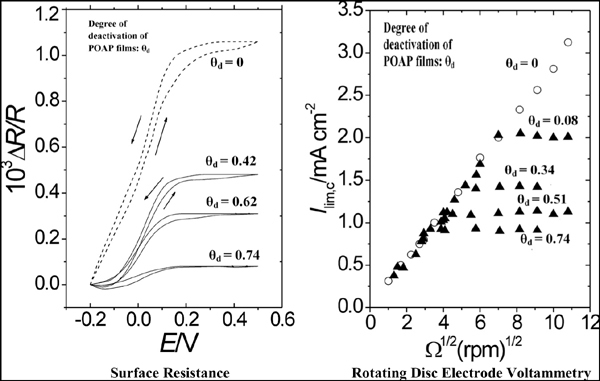 Deactivation of poly(o-aminophenol), conductivity, charge transport parameters, surface resistance, steady-state, diffusion coefficient.